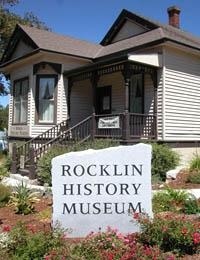 Rocklin is a city in Placer County, California located approximately 22 miles from Sacramento, California, and about 6.1 miles northeast of Roseville in the Sacramento metropolitan area and approximately 100 miles from either Lake Tahoe, San Francisco, or Napa Valley. Rocklin is intersected by Interstate 80 (a heavily travelled freeway for both commerce and travelers) and Highway 65 (largely serving commuter and regional traffic). A major east‐west rail line operated by Union Pacific runs through Rocklin, and the Rocklin train depot is served by Amtrak for regional, statewide, and interstate service. Rocklin Ranked in the 2017 list of best Sacramento area-elementary schools by Niche.com and one of the best places to raise a family via Wallethub. Rocklin Unified School District provides K-12 education in Rocklin. In addition there are several charter and private schools that serve Rocklin. Rocklin is also home to Sierra College (two-year community college) and William Jessup University (private university). Population: 60,351 (May 2016) Rocklin has a median household income of $79,274 (2010-2014). As of April 2016, Rocklin has an estimated civilian work force of 30,100 with an unemployment rate of 4.4%, an improvement of .4 percent from May of 2015. Approximately 40% of Rocklin citizens over age 25 hold a bachelor’s degree or higher. Rocklin has a current median age of 36.3 years.